Monocyte. 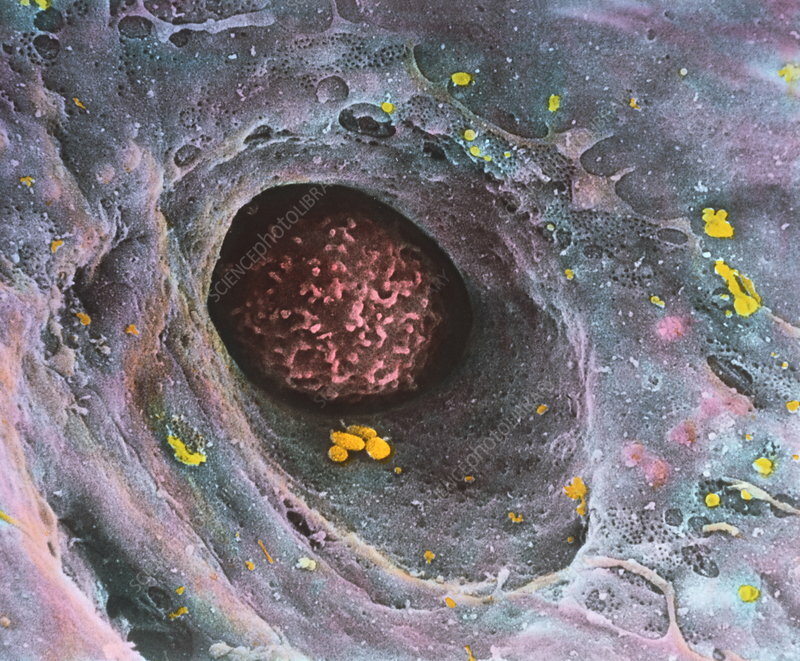 Coloured Scanning Electron Micrograph (SEM) of a monocyte (macrophage) in a blood capillary of the adrenal gland. The monocyte (pink) is the largest type of white blood cell. It has little function in blood, but migrates into tissues. Here, it is seen passing through a porous capillary (blue) which has debris of blood platelets (yellow). Protruberances on the surface of the monocyte cell help it to move. In tissues it scavenges and engulfs cellular debris & foreign micro-organisms. Monocytes thus play an important role in the initial phase of the body's immune response. Magnification: x3,300 at 6x7cm size.